MAESTRO : is one of the programming solutions which “ NOVA MASR FOR TECHNICAL SOLUTIONS “ company offers . The ease , flexibility and speed in handling. Maestro supports all types of sales (Dine in-Take away-Delivery). 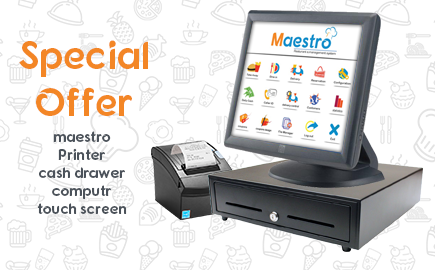 Maestro”s distinct selling point is simple form and enables the cashier to receive orders from the customer rapidly. A wide and comprehensive reports with the ability to control the format of the report. Report curves graphic to make it easier for management decision-making. Maestro supports the ability to print reports on all types of printers (laser-thermal).